Run your finger or the cursor back and forth along the midline between these two ramp gratings and track your finger or the cursor with your gaze. 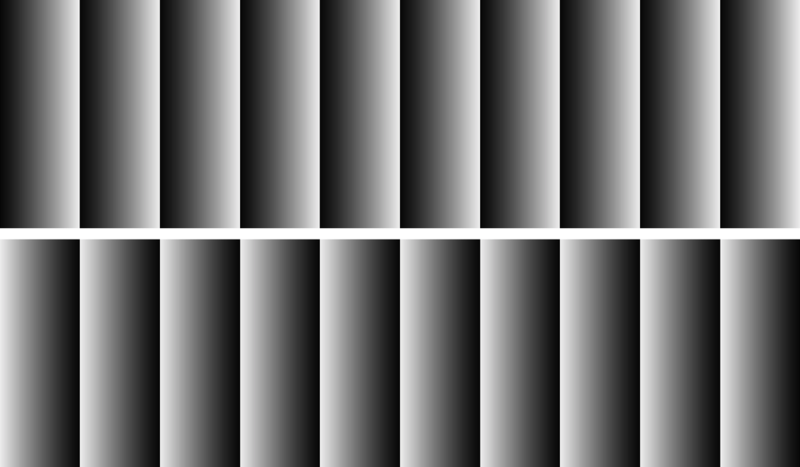 The top grating should appear to brighten as you move to the right and the bottom grating will dim. The effect reverses when you reverse the direction of travel (Cavanagh & Anstis, 1986, PDF). These are the local effects of asymmetrical brightening and dimming originally studied by Stuart Anstis using full field stimuli having a ramp temporal waveform. We attribute the brightness shift to the saturation of the transient response to the sharp return so that it does not have the magnitude to cancel the opposite shift in the direction of the shallow change.